"Shooters Gallery" photo album to view some of our hunters, the fields and MORE! More reasons to hunt at "The Ringneck Ranch LLC"
Superior cover, including bean fields: corn fields; fence rows and sorghum. ready for your ice filled cooler. All Day Hunts . . . 8:30 a.m. - 5:00 p.m. Morning Hunts . . 8:30 a.m. - 12:30 p.m. Afternoon Hunts . 1:00 p.m. - 5:00 p.m.
Half Day Hunts = 4 pheasant minimum set per shooter. Full Day Hunts = 8 pheasant minimum set per shooter. Bird Cleaning: $2.50 each. Available on weekends. The pheasants we clean are the same pheasants you just harvested during your hunt that day, not birds kept back and frozen from previous hunts. We maintain professional processing equipment and mechanically process and package all of your harvest with skin intact. You get extremely fresh, never frozen game of gourmet quality that is perfect for grilling, smoking or roasting. Birds processed, bagged and divided equally among participants ready for your ice filled cooler. We Accept Cash & Check as payment. All hunters are required to register their name and address. No consumption of alcohol prior to, or during the hunt. Dogs must be under strict control of their handlers and kept clear of the gamebird pen area at all times. Birds shall not be shot while on the ground. Dogs will retrieve any "downed" birds. All vehicles must be parked in designated areas. Hunters must stay in their assigned area and on the property. 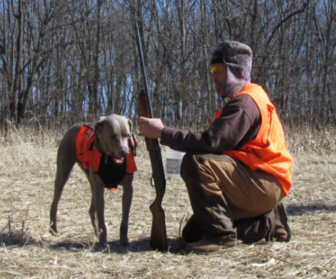 All hunters must wear "Hunters Blaze Orange" visible to other hunters. Hunters participating in European hunts are required to wear eye protection. Ear protection is recommended. Persons failing to follow regulations or those that behave in an unsafe manner may be requested to leave the property.